The story of Maria Altmann’s legal battle with the Austrian government over paintings that had been seized from her family by the Nazis is coming to the big screen this week in the film Woman in Gold, starring Helen Mirren as Altmann. The story is well-known and compelling: the Nazis confiscated the collection of Ferdinand Bloch-Bauer, Maria’s uncle, after the Nazi annexation of Austria in March 1938. Bloch-Bauer fled to Zurich, and Nazi officials and representatives of what would later become the Österreichische Galerie Belvedere met to determine how to divide up Bloch-Bauer’s property and belongings. His extensive porcelain collection was sold at auction, much of it going to Vienna’s museums, while Hitler and Reichsmarschall Göring confiscated some of Bloch-Bauer’s Austrian paintings for their own personal collections. Other pieces were purchased for Hitler’s planned Linz museum, including Ferdinand Waldmüller’s Little Count Esterhazy. The painting passed through the Munich Central Collecting Point (it was assigned Munich number 8954) and was returned to Austria in 1948. 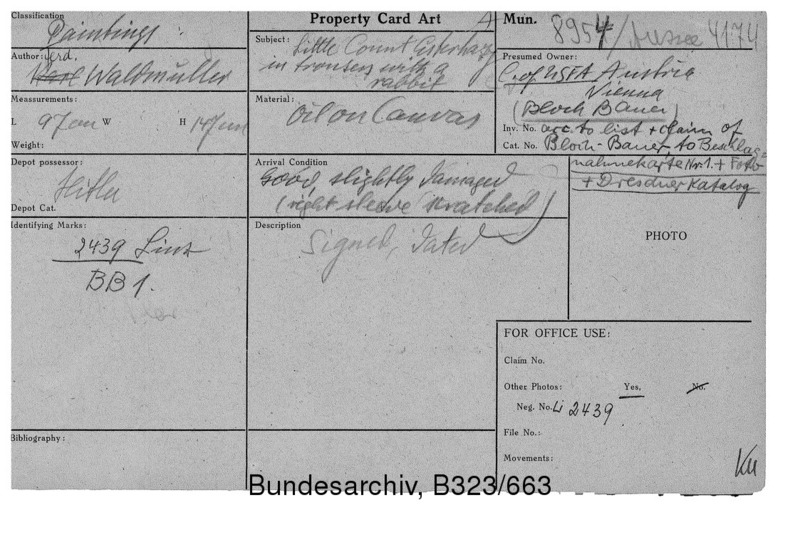 The Collecting Point property card for the painting, which records its confiscation from the Bloch-Bauer collection and its Linz designation, is seen below (front and back). Among the looted paintings was the titular portrait by Klimt of Ferdinand’s wife, Adele. However, rather than returning the paintings to Bloch-Bauer after the war, the Austrian government kept them, maintaining that in her will, Adele, who died in 1925, “required” that after his death (in 1945) Ferdinand donate the paintings to what would become the Österreichische Galerie Belvedere. Of course, at the time of her death, Adele could not have known how different the circumstances would be 20 years later, and in any event, Ferdinand’s will in fact left his estate to his nieces and nephews (including Maria Altmann). And what of Adele’s “requirement” that Ferdinand donate the paintings on which the Austrian state’s argument hinged? Her will uses the following language: “I kindly ask my husband…” Hardly an emphatic demand. In 1998, when the Austrian government passed a restitution law that nullified agreements such as the practice by which Austria would return certain looted artworks only if the owners signed away their rights to other confiscated objects to the state, the ministry of culture also opened its archives to researchers. One such researcher, journalist Hubertus Czernin, examined the newly accessible records and concluded that Ferdinand had not donated the paintings to the museum. Altmann and her attorney E. Randol Schoenberg (played by Ryan Reynolds in the movie) filed a claim, and after a series of appeals, Schoenberg ultimately convinced a panel in Austria that Adele’s will requested, but did not require, Ferdinand’s donation of the paintings to the museum. In January 2006, Altmann was awarded ownership of the five paintings. Four of the paintings were sold by Christie’s to private collections for a total of over $192 million, while the Portrait of Adele Bloch-Bauer I was purchased by the Neue Galerie in Manhattan with funds provided by Ronald S. Lauder, philanthropist and founder of the Commission for Art Recovery, for $135 million, making it at the time the highest price ever paid for a painting. Although Maria Altmann’s case was very high-profile, Woman in Gold will certainly introduce her story to a new audience and bring the topics of Nazi-looted art and restitution issues further into the public eye. “Maria Altmann, Pursuer of Family’s Stolen Paintings, Dies at 94,” The New York Times, Feb. 9, 2011, http://www.nytimes.com/2011/02/09/arts/design/09altmann.html?_r=0. 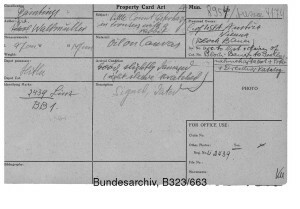 “Maria V Altmann Case re: Bloch-Bauer paintings,” Lootedart.com, http://www.lootedart.com/MFEU4R18009_print;Y.
Datenbank zum “Central Collecting Point München,” Deutsches Historisches Museum, http://www.dhm.de/datenbank/ccp/dhm_ccp.php?seite=9. 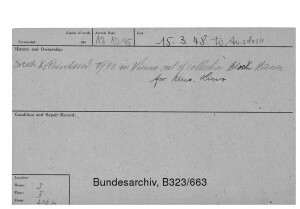 Records Concerning the Central Collecting Points (“Ardelia Hall Collection”), Munich Central Collecting Point, 1945-1951. RG260. M1946. 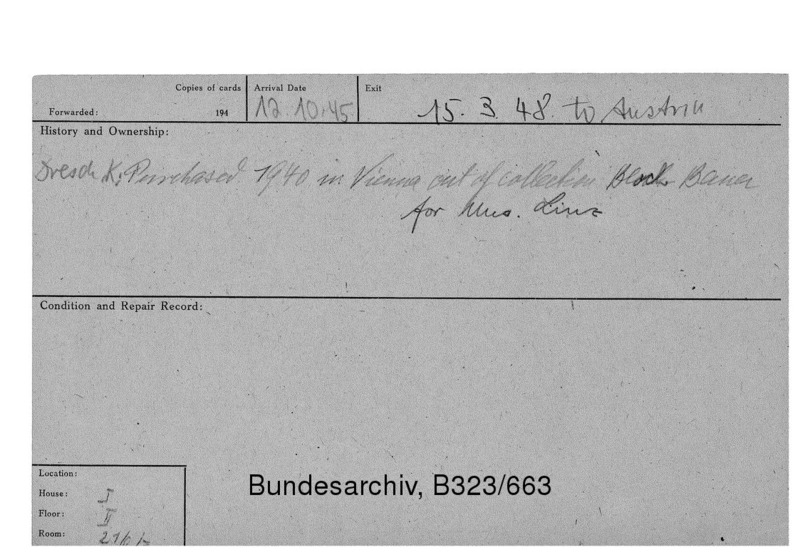 Restitution Research Records. Linz Museum: Consolidated Interrogation Report (CIR) No. 4. P. 40. http://www.fold3.com/image/283755450/.